It's a very long flight from Amsterdam to Singapore, 12 hours in a cramped cattle class seat, in a row shared with two obese tourists. The video system had to be rebooted twice, and 500 people got to watch the boot messages. 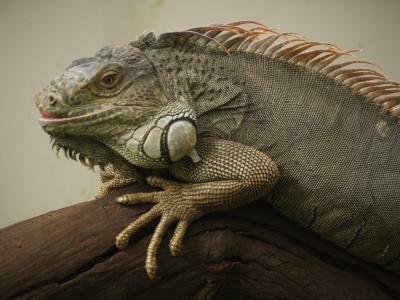 It's an old 2002 RedHat Linux on the world's slowest processor, a Geode, heavily customized by an Ogre with a broadax - tons of errors and debugging output. If that's an indication of Boeing's engineering and quality control, it's a miracle that the plane managed to take off without losing its wings. The taxi to the Hangout Hotel on top of Emily Hill is cheaper than the bus for two people. The hotel is simple, clean, modern, and offers free WLAN and a fantastic rooftop terrace. Singapore is a large city dominated by office and residential towers, but Emily Hill is one of the few green spots inside the city. New construction is eating into the hill though. Singapore is a rather small island that was part of the British empire, occupied from Sir Stamford Raffles, and then Malaysia before it became independent in 1965. The name Raffles is still everywhere, like many other British names. The island is forested outside the city. 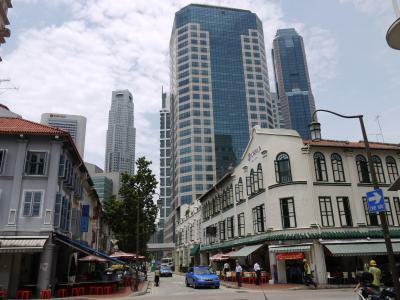 There isn't much to do for tourists in Singapore except shopping. 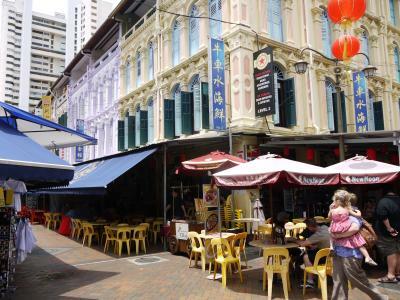 Bugis street, one of the oldest shopping districts of Singapore, is very close to the hotel. It's a curious blend of a chaotic Asian market with a modern shopping mall. There is a large covered bazaar selling everything - cheap clothes, watches, cell phones, fruit and vegetables, on several floors. There are fruit juice stands, but the red dragonfruit and guava juices were rather bland. Bottled starfruit juice is downright nasty. 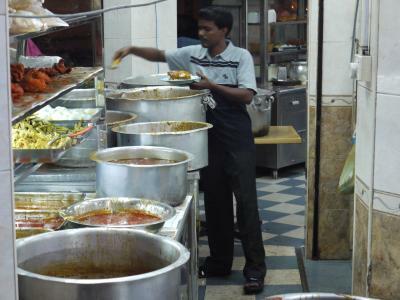 We also walked to the Indian quarter in the north of downtown and had good Tandoori chicken. I saw two mosques, two churches, one synagogue, and one Krishna temple with gaudy LED ornaments and happy monks daubing a third eye on tourists. There are large office towers and low two-story and five-story buildings side by side. Everything is squeaky clean - that day I have seen one abandoned plastic bottle, a handful of cigarette butts, and a rusty washing machine. Everything else is spotless. Possession of drugs and chewing gum is illegal in Singapore, but smoking is ok. These people have principles. Street and shop signs are English in Singapore, and it's disappointingly correct English instead of the hilarious Chinglish they use in China, like my favorite in Lijiang in Yunnan: "Civilized behavior of tourists is another bright scenery rational shopping". 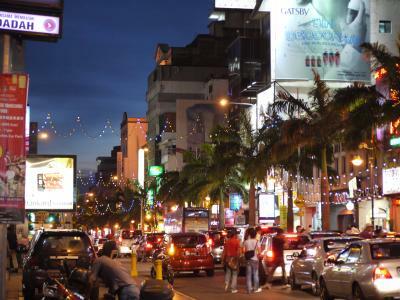 Orchard road is Singapore's main shopping street, but it's unimpressive. It's a wide street with lots of traffic, and the usual international chain stores scattered along its length. It's crowded but still oddly lifeless. The nearby Fort Canning Park is quite pleasant though, although the fort is curiously absent except for one remaining gate, and the little lake is fenced in and hidden, with big red no-trespassing signs showing a policeman pointing a rifle at a stick figure with its hands up. You can see these signs elsewhere too, welcome to Singapore but stay where you are. 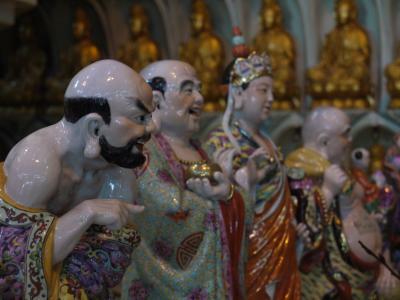 Chinatown is divided into a busy modern main road and an old pedestrian area with narrow alleys crowded by small shops and restaurants, with low old buildings. It's odd to see how the vertical modern Singapore alternates with old two-story buildings. At a wide section of the Singapore River, the low buildings between the riverfront and the highrise office towers in the background look like flotsam. The bank towers are here because it's a particularly auspicious place and good omens are hard to come by these days in the banking business. 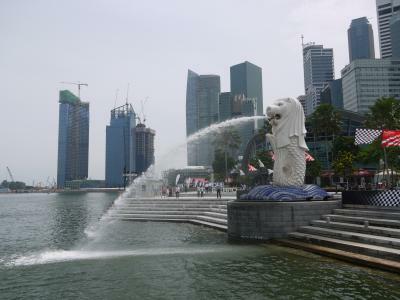 At the Marina Bay is the Merlion, a statue of a fish with a lion's head spouting yellowish water, and across the river are the Esplanade theaters, with the main building looking like a crash-landed spiky Durian. I have been keeping count of all the countries I have been in over the years, and this is an anniversary: Malaysia is number 50. The "executive bus" from Singapore to Kuala Lumpur is spacious, comfortable, and falling apart inside, but I found a seat that worked. The formalities at the border are simple: the bus stops once on the island of Singapore to exit and once on the Malaysian mainland to enter, and the whole procedure takes only minutes. We got to the Royale Bintang hotel, with a (partial) view of the landmark Petronas Towers from our room, in the early afternoon and had time to wander. 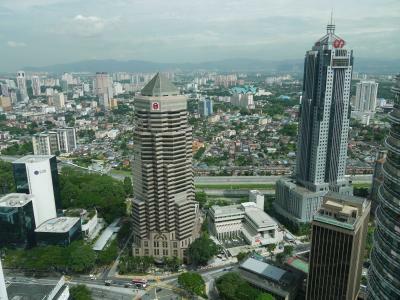 Like Singapore, Kuala Lumpur is a mixture of modern highrise buildings with thundering traffic, and low-key old districts like Chinatown and the colonial district. Chinatown is fairly small but very lively - four large blocks, bisected by two pedestrianized streets packed with stalls selling watches, cell phones, bags, clothes, and souvenirs, and there are a number of Chinese hole-in-the-wall restaurants. We also went to the modern district past Chinatown, but it's basically one big tangle of freeways. Walking is possible but unpleasant. We made it alive to the central train station, which looks like a Moorish mosque from a distance, and took the elevated monorail train back to Bintang. Looks like futuristic design from the eighties. 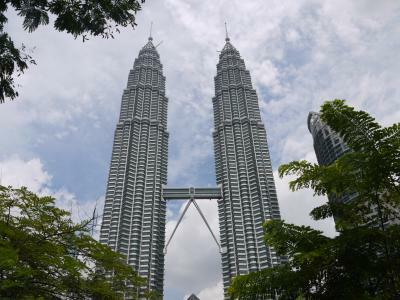 The twin Petronas Towers are the main landmark of Kuala Lumpur. It takes four hours to get tickets and enter, but we had reserved tickets at the hotel the night before. First, visitors have to sit through a cheesy company PR video with bad 3D effects and an excited narrator praising the Petronas oil company for seven minutes. We passed through an X-ray checkpoint (can't bring weapons or chewing gum), and shot up the elevator to the skybridge that connects both towers at the 40th floor. Visitors can't go any higher than that, but the view of the towers and the city is fantastic. They only let a few people in at a time. A glass floor would have been even better, even a small one like in the Tokyo tower. 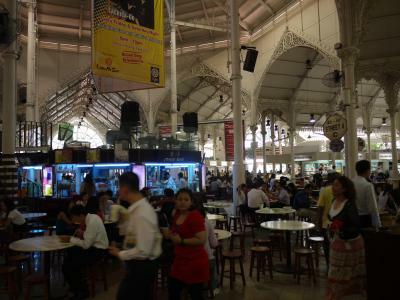 The old Malay quarter is one metro stop and a whole world away from the shiny stainless-steel Petronas towers. It's all old low buildings and shacks, and dimly lit food stalls under large corrugated metal roofs. We had Menara Condong Nasi Lemak with Chicken Rendang and various appetizers at the Shazana Pau Café. I have no idea what the name of the dish means but it was very good. 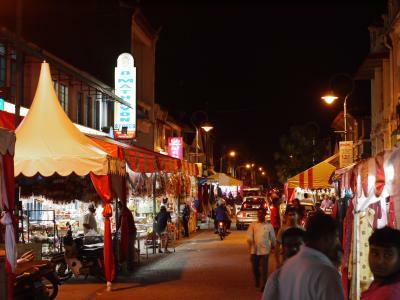 Little India in Kuala Lumpur is similar to the one in Singapore, plus a few covered alleys that are even more packed than Chinatown. 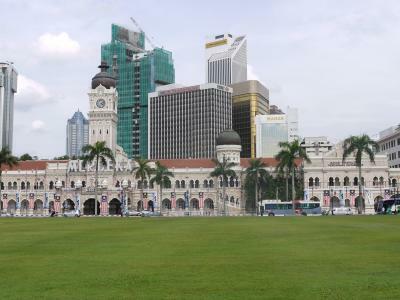 The Colonial District is centered on Mardeka Square, a very large lawn with a 95m flagpole at one end where Malaysia celebrates independence since 1957. Stepping on the lawn, or any of a very long list of other offenses that boil down to "because the governor said so" carry a fine of 1000 Ringgit (200 Euro) and up to a year in prison. Colonial buildings in a fancy British/Indian style line one side of the square and, strangely, half-timbered houses the other. 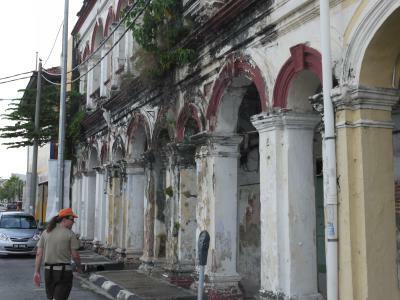 Pulau Pinang, aka Penang, is a large island off the west coast of Malaysia. The main town is Georgetown. Our hotel, the Segora Ninda, is a heritage building open to visitors. It's charming but not as cosy as expected, and its heritage DHCP server is unbearably slow. 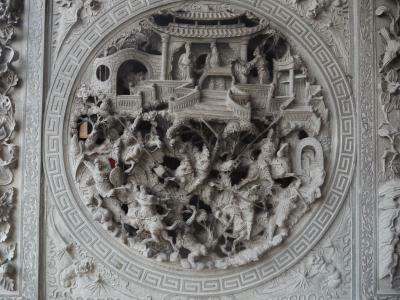 Georgetown's Chinatown is a Unesco world heritage. 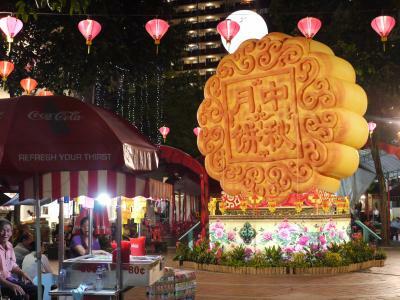 It's much larger than the one in Kuala Lumpur, and much less touristy. There are almost no souvenir shops or touts. It doesn't feel very authentic though because the locals treat it poorly - Chinese obliterate history where they can - it's quite dilapidated except for the asphalt roads that carry heavy traffic everywhere. This Chinatown lacks the bustling life found elsewhere. Lots of parked cars, and closed shops and restaurants, further reduce the century-old houses to window dressing. Of course, Georgetown also has the usual faceless modern town; and a Little India and a Colonial District that share Chinatown's fate. Cheong Fatt Tze was the Asian Rockefeller a hundred years ago. When he died, he left his huge mansion in Georgetown to his son under the condition that it won't be sold until the son dies, so after the family fortune went south they had to sell the furniture and rent rooms to over 30 families. Today it's a museum and hotel, perfectly restored from those years of neglect. Feng Shui dictated that the back of the house be one step higher than the front to simulate a hillside, and the construction includes the five elements of Feng Shui: earth, fire, water, iron, and wood. Actually wood couldn't be used in the construction because it couldn't take the load so the beams are actually iron painted like wood, hoping that the gods won't notice. Later we took local bus 203 to Air Itan, which sounds like an airline but is a village in the middle of the island. 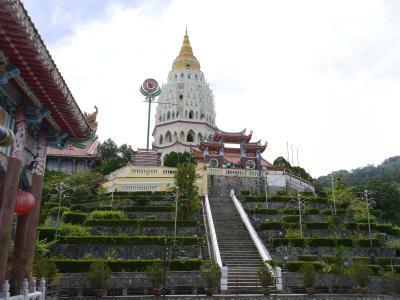 The Kek Lok Si temple there is a beautiful and large complex of temples on top of a hill, crowned by the 10,000 Buddha Pagoda whose architecture is Chinese at the bottom, Thai in the middle, and Burmese on top. 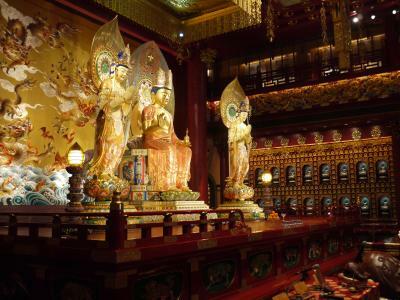 Several souvenir shops are conveniently located right in the prayer halls and pagodas. 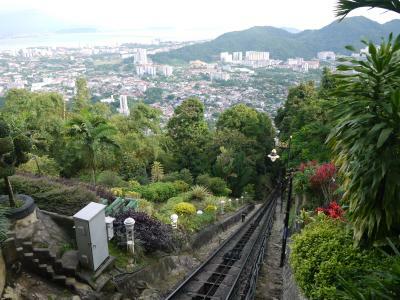 After a short taxi ride we went up Penang hill, riding a Swiss-built cable car to the top, 700 meters above the city. 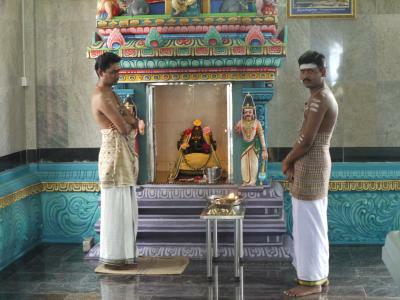 There is a small but colorful south Indian Hindu temple and a small diminutive mosque up there, and a loud and annoying snake show for tourists. The panorama is fantastic. Just as we returned to the cable car station, torrential rains started. Georgetown looks nicer at night. The darkness hides crummy architecture. The rain has driven many outdoor restaurants indoors though, except in a very short alley near the waterfront where modern clubs and restaurants flash their lights. Malaysia is a Muslim country but some of the women here are dressed very perfunctorily. 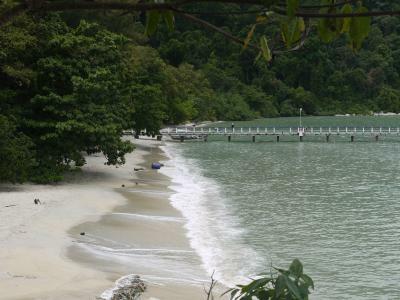 Penang National Park is at the northwest corner of the island. It's a true old-growth primeval jungle - densely overgrown, full of animals calling (why do most wild animals sound like ringtones? ), with a few paths leading to the main attractions. 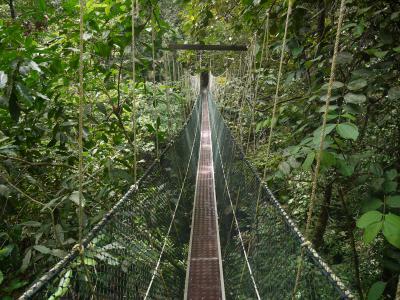 The Canopy Walk consists of 250 meters of 30cm wide walkways strung between trees some ten meters above the ground. The bridges are suspended from cables, and shake and twist when walking on them. Another trail leads to a couple of beaches. Most of it is a muddy, rocky trail covered with roots leading up and down the edge of the water, quite difficult to walk without hiking boots. Saw a few monkeys in the trees; we watched them and they watched us, but we had cameras and they didn't. At the USM Cemac beach, young veiled women in shorts were playing and laughing. 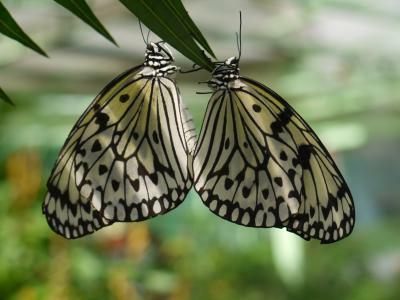 We also went to the Butterfly Garden two kilometers away; they not only have lots of large tropical butterflies in a large greenhouse full of tropical plants, but also spiders with hairy legs, scorpions, an iguana, turtles, and assorted other local animals. Chewing gum is legal in Malaysia but it's still very clean. I saw people sweeping the jungle with brooms. There are no floating plastic bags and bottles like in so many other Asian countries. Most people speak broken English. The Hong Kong Dim Sum in the Red Garden Food Paradise a little down the road from the hotel is great. We got all sorts of Dim Sum, and I had a Malaysian Ambra juice: green, sweet and sour, and tangy like green fruit. Delicious. Walked Little India at night. Lots of neon, loud music, street vendors, crowds shopping and eating at restaurants open to the street. Also checked out the Colonial Town at night, where all the old British architecture is floodlit at night. Even Love Lane with its seedy backpacker hostels looked serene at night. Georgetown's discolored concrete and peeled paint looks like charming patina at night, rather than decrepit neglect during the day. If you want to enjoy Georgetown, 19:00-23:00 is the right time of the day.